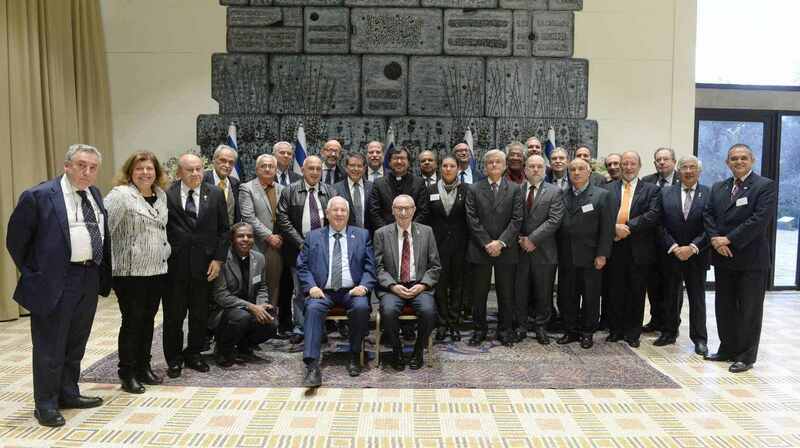 Jerusalem, December 15, 2016 — Some twenty rectors from leading Latin American universities visited Israel this week and signed agreements with the Hebrew University of Jerusalem, in a first-of-its-kind conference signaling growing academic cooperation. Representing institutions in Argentina, Bolivia, Brazil, Chile, Colombia, Costa Rica, Dominican Republic, Ecuador, Honduras, Nicaragua, Paraguay, Peru, Uruguay, and Venezuela, the rectors learned about Hebrew University academia and research, and signed about 20 cooperation agreements with the Hebrew University. The rectors were hosted at a special dinner in their honor with Prof. Menahem Ben-Sasson, the Hebrew University’s president, and Prof. Robert (Israel) Aumann, a Nobel laureate and the S.A. Schonbrunn Professor Emeritus of Mathematical Economics at the Hebrew University. Also in attendance were foreign diplomats and representatives of Israel’s Foreign Ministry, which co-organized the conference with the Hebrew University’s Harry S. Truman Research Institute for the Advancement of Peace. “This was a very productive gathering and we hope it will lead to many fruitful collaborations with universities in Latin America,” said Naama Shpeter, executive director and the conference organizer at the Truman Institute. A highlight of the rectors’ visit was a meeting with the President of the State of Israel, Mr. Reuven Rivlin, at his official residence in Jerusalem. The rectors also attended social sciences and humanities lectures at the Mt. Scopus campus, met with scientists at the Edmond J. Safra campus, and visited the Robert H. Smith Faculty of Agriculture, Food and Environment in Rehovot. The Hebrew University of Jerusalem is Israel’s leading academic and research institution and is ranked among the top 100 universities in the world. Founded in 1918 by visionaries including Albert Einstein, the Hebrew University is a pluralistic institution where science and knowledge are advanced for the benefit of humankind. The Hebrew University produces one third of all civilian research in Israel. For more information, please visit http://new.huji.ac.il/en.